Finding a new particle is always a nice surprise, but measuring its characteristics is another story and just as important. Less than a year after announcing the discovery of the particle going by the snappy name of Ξcc++ (Xicc++), this week the LHCb collaboration announced the first measurement of its lifetime. The announcement was made during the CHARM 2018 international workshop in Novosibirsk in Russia: a charming moment for this doubly charmed particle. The Ξcc++ particle is composed of two charm quarks and one up quark, hence it is a member of the baryon family (particles composed of three quarks). The existence of the particle was predicted by the Standard Model, the theory which describes elementary particles and the forces that bind them together. LHCb's observation came last year after several years of research. Its mass was measured to be around 3621 MeV, almost four times that of the proton (the best-known baryon), thanks to its two charm quarks. The Ξcc++ particle is fleeting: it decays quickly into lighter particles. In fact it was through its decay into a Λc+ baryon and three lighter mesons, K-, π+ and π+, that it was discovered. 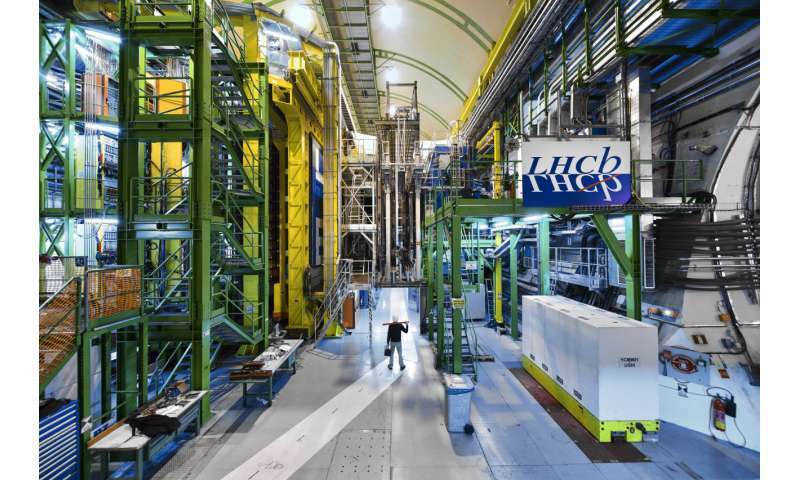 Since then, LHCb physicists have been carrying on an analysis to determine its lifetime with a high level of precision. The value obtained is 0.256 picoseconds (0.000000000000256 seconds), with a small degree of uncertainty. Though very small in everyday life, such an amount of time is relatively large in the realm of subatomic particles. The measured value is within the range predicted by theoretical physicists on the basis of the Standard Model, namely between 0.20 and 1.05 picoseconds. To achieve this precise result, LHCb physicists compared the measurement of the lifetime of the Ξcc++ with that of another particle whose lifetime is well-known. They based their measurements on the same sample of events that led to the discovery. Measuring the lifetime of a particle is an important step in determining its characteristics. Thanks to the abundance of heavy quarks produced by the Large Hadron Collider (LHC) and the excellent precision of the LHCb detector, physicists will now continue their detailed measurements of the properties of this charming particle. With these types of measurements, they are gaining a better understanding of the interactions that govern the behaviour of particles containing heavy quarks.